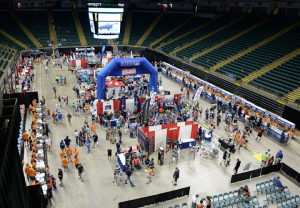 The 2019 Air Force Marathon Sports and Fitness Expo is Thursday, September 19, and Friday, September 20. Registration for expo vendors is open! Click here to register. Live map available on registration site. Expo vendors will have the opportunity to promote and sell their products and/or services to thousands of runners, health & fitness enthusiasts and spectators. The expo offers merchandise sales opportunities, sampling, running clinics, stage floor performance/demonstration opportunities, speaker’s forum and more. Our professional staff will work with your organization to help you achieve your marketing goals and ensure promotional success. The Sports & Fitness Exposition is free to attend and open to the public. Approximately 30,000 people attended the 2018 Expo. Our runners represented all 50 states, the District of Columbia and 13 foreign countries. This gives expo vendors the opportunity to connect with a large and global target market of health & fitness enthusiasts. In 2019 we estimate 15,000 participants in the Air Force Marathon. Our one-way circular concourse traffic flow encourages visitors to walk past every vendor in order to get to bib pick-up. We have expanded the number of booth spaces on the arena floor to put vendors right next to bib or shirt pick-up. 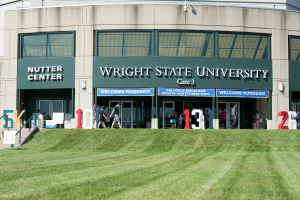 Wright State University’s Nutter Center is a state of the art facility conveniently located near Wright-Patterson Air Force Base and Wright State University. There are many hotels and restaurants located nearby for the convenience of our vendors and race participants. Income Levels: 69% live in households earning more than $50,000.